As a homeschooling mom, I love when I know a company is a reliable source for quality curricula. After Latin for Children and Art of Argument, I know that Classical Academic Press in one of those companies. I was very interested in seeing if my thoughts would be reinforced after utilizing God’s Great Covenant. God’s Great Covenant is a four part course that takes the student on a journey through the Old and New Testaments. Instead of choosing a Bible story or event to focus on, God’s Great Covenant emphasizes the importance of a chronological, purposeful study of the whole Bible. Through this type of study, you are able to see how God has moved through His people over time and gain understanding of His covenant. God’s Great Covenant is taught from a covenantal and reformed theological perspective, and rooted in Scripture; just a fact to be aware of in case you are looking for a Bible curriculum without a reformed theological focus. 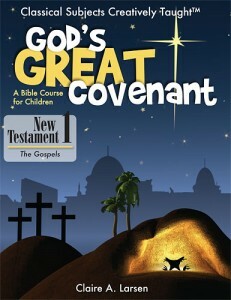 God’s Great Covenant: New Testament 1 is a course designed for 4th graders and up. I chose to bring all my children together and we had fabulous discussion! For the course there is a student workbook, teacher’s text and mp3 audio available. GGC New Testament 1 covers the four Gospels; bringing them together to be studied and understood. The course begins with an Introduction sections and will take several days to work through. So much information that really helps create a clear picture of where God’s people are at when the Gospel begins. The Introduction is very helpful if you have not covered the Old Testament. There are several introductions: Historical/Political, Chronological, Geographical, Religious and Daily Life. As we studied the introductions it was refreshing to see how much my children were familiar with and enlightening on what we all learned together! After the introductions New Testament 1 is broken up into four units; each unit contains 9 chapters which include a review of what has been learned. Each chapter has focus texts from the Gospels; pulling parallel text together for a full picture of what is being studied. A memory passage is suggested and key facts are provided. 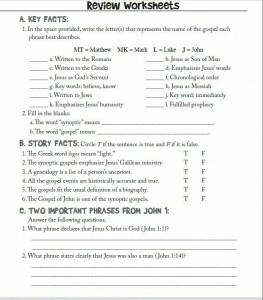 After the reading, there are review worksheets to aid in retention of the material that includes a “think about it” question to help the student apply the Scripture personally. The teacher text provides the same information as the student workbook but has added in-depths notes for the teacher to use in discussion or even older students could read on their own. The in-depth notes are a wonderful resource of information. God’s Great Covenant: New Testament 1 is a thorough, meaningful Bible study. It also provides answers to the review worksheets. In the past, I have not been impressed with various Bible curricula. Either it has been simplified or didn’t match our theological perspective. Classical Academic Press recognizes the ability of our children to study and learn and it shows in God’s Great Covenant. My children and I have had fabulous discussions as we are working through this course. I think that it has worked well to bring everyone together for this study but would have no qualms about handing the teacher’s text to my older children for independent study. The mp3 audio files were not used for our family study time but work great for the younger ones to listen to during quiet time. The audio files would also be helpful for students who struggle with reading and could better focus having the text read. One aspect of God’s Great Covenant: New Testament 1 was an issue for our family. The student text is meant to be consumable so copies can not be made of the review worksheets. 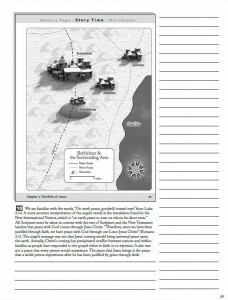 Each student would need their own text if the review portions were used. Due to our family circumstances, we could not purchase student workbooks for each child. Classical Academic Press publishes excellent products and they are worth the pricing; it just wouldn’t be allowable for our family. We worked around the issue by having family discussion which is our preference. God’s Great Covenant: New Testament 1 can be purchased as a bundle or the each resource can be purchased individually. Take a moment to check out God’s Great Covenant: New Testament 1 and the other products at Classical Academic Press! Also other TOS crew members have their thoughts to share! **Disclaimer: As a member of the TOS Review Crew, I received a complimentary copy of this product for the purpose of review. No compensation was made. The thoughts/opinions expressed in this post are my own. This entry was posted in Homeschool, TOS Crew Reviews and tagged Bible, Christian, classical, curriculum, family, Homeschool, review by sweetie. Bookmark the permalink.